I work part time as the local chaplain for a hospice. Note that the words hospice, hospital and hospitality all are related. Their root word is “hospes”, that is host. All three of these related words have to do with being a host. As a chaplain, I am a guest in many homes of dying family member and the family member is my host. A hospital, the host, welcomes guests…quite a different understanding than patients! Many a hospital guest will note the care of especially the nursing staff, as do hospice patients,because they are welcomed and taken care of. Hospitality is a requirement of a pastor and a bishop: to welcome friends and strangers to his home as guests. It is hard work to be a host: food,linen and beds, wounds of body and soul. It is easy to say that government should take care of the refugee, immigrant or the foreigner and pat one self on the back that I am caring! It’s another thing to actually love your neighbor, one to one, as Christ has served us and serves us daily. Elizabeth of Hungary knew that. She was royal as a faithful wife and mother and as one who served the poor. Maybe the hosts of these homes and churches do welcome the immigrant, the stranger,the persecuted. Again, it’s easy to say I back some politically correct policy and never welcome a stranger into my home. Elizabeth of Hungary, and Martin Luther in the quote below teach us in word and deed the Biblical understanding of hospitality and it is hands on, not hands off letting someone else doing it, especially government! After all, our salvation was and is “hands on”, nail-imprinted Hands. Mighty King, whose inheritance is not of this world, inspire in us the humility and benevolent charity of Elizabeth of Hungary. 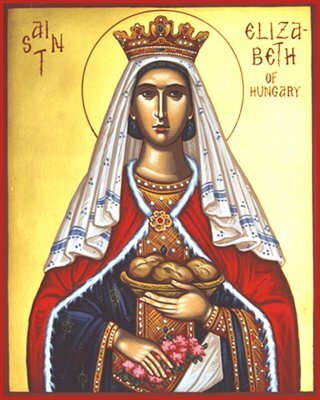 She scorned her bejeweled crown with thoughts of the thorned one her Savior donned for her sake and ours, that we too, might live a live of sacrifice, pleasing in Your sight and worthy of the Name of Your Son, Christ Jesus, who with the Holy Spirit reigns with You forever in the everlasting kingdom. Amen.